After 80 years of persistent growth, Washington’s annual spending on entitlements now accounts for more than half of total federal outlays. In this article, Alan Hall surveys the multi-decade, social-entitlement tsunami – a wave that, like all others, will eventually subside as social mood hits bottom. Here is an excerpt of his May 2012 report. The top (red) line in Figure 1 plots 80 years of rise—a 17-fold increase—in U.S. government entitlements as a percentage of total personal income. The lower graph is the Dow Jones Industrial Average adjusted for inflation via the Producer Price Index (Dow/PPI). For ease of reference, we added Elliott labels to the entitlements trend. … The long-term trend in both lines has been dramatically higher. But the timing of their movements differs radically. During positive mood phases, entitlements tended to slow or even retrace their ascent. During negative-mood phases, entitlements expanded dramatically. Specifically, during the three bear phases in the Dow/PPI, the entitlement ratio increased by 500%, 100% and 45% respectively, for an average gain of 215%. In sharp contrast, the bull phases saw a gain in entitlements of 7% and a loss of 1%, for an average gain of just 3%. 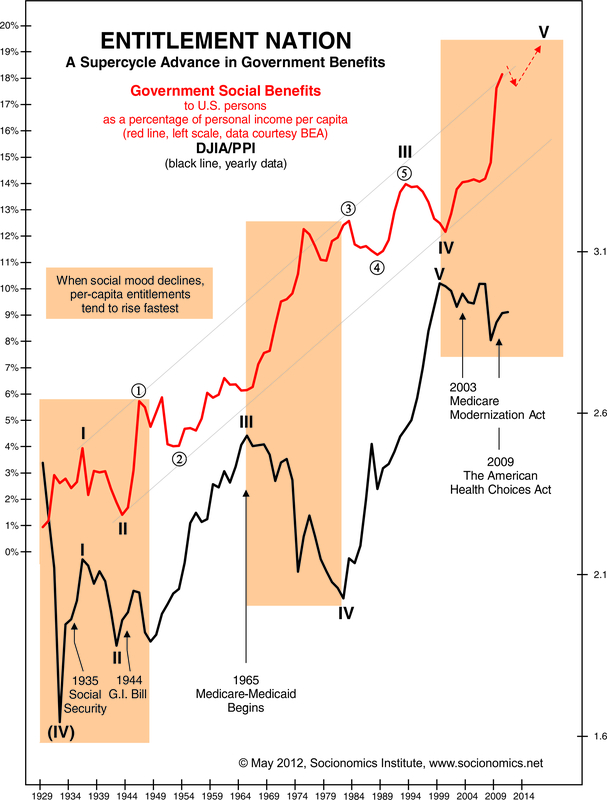 The large-degree negative social mood trend that began in 2000 will indeed drive the current entitlement boom higher. But the CBO’s 25-year forecast is a linear projection—an assumption that the trend of recent decades will continue—and does not consider future fluctuations in social mood. In the remainder of this article, author Alan Hall explains why the impending collapse in government entitlements may occur sooner than almost everyone (including staffers at the CBO and Treasury Department) think. Extremely fascinating topics like this one are the usual unusual fare in The Socionomist. Without a subscription, you’ll never really understand what truly is happening in society today and the forces behind those trends. But the great news is: You can get not only the rest of Alan Hall’s unique perspective on entitlements in America—but also the full archive of past issues when you subscribe.